Crystal Rose started her career as an associate at Carlsmith-Ball before becoming a Construction Law lecturer at the University of Hawaii from 1986 to 1989. She eventually became a partner at Bays et al in charge of commercial, real estate, construction and trust litigation. 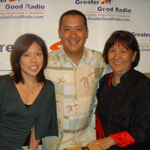 In 2000 and 2005, Crystal received the O’o Award – Hawaiian Business Person of the Year, and the Pacific Business News Business Woman of the Year Award, for her outstanding performance as an entrepreneur. And complementing these honors is her involvement in more than a dozen community organizational boards, demonstrating her status as a powerhouse in both the business and non-profit community in the State. Crystal Rose imparts to us how she effectively manages her time between family, business, and community involvement. She also shares how Kamehameha Schools and Bernice Pauahi Bishop have become instrumental in her dreams of giving back to the community. In this Greater Good Radio episode, Crystal talks about her active involvement in community-based organizations despite the hectic business schedule that she carries with her. She also mentions how mutual support within her family reinforces the bond that they have, which enables them to work beyond their normal capacity. You can find out more as you listen now to this Greater Good Radio interview with Crystal Rose; mother, entrepreneur, lawyer, philanthropist.